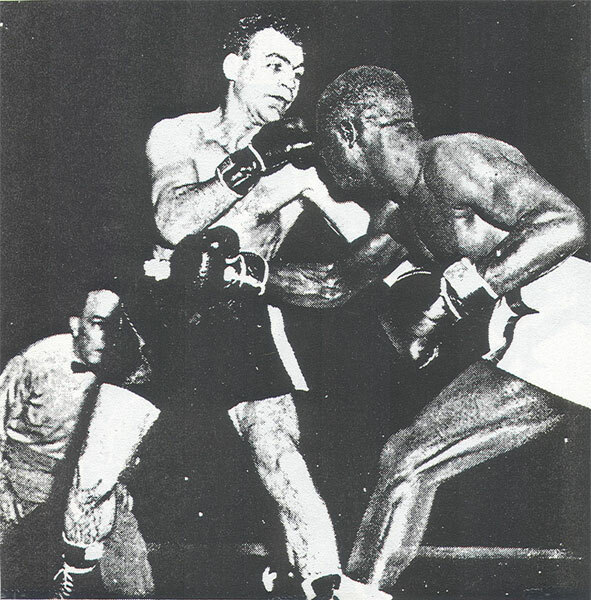 On this day in 1949, South Philadelphian Eddie Giosa took a close but unanimous decision against Percy Bassett, the sad-eyed slugger from West Philly, in a 10-round bout at the Philadelphia Arena, before 3,359 fans. Although Eddie wound up on top, it was a struggle, especially early on. In the very first session, Bassett backed Giosa against the ropes and landed one of his trademark right hand bombs. Giosa sank down as the dizzy crowd figured it was all over. But Giosa showed his toughness by climbing up the ropes and stepping back into the fray. He played it safe for the remainder of the round and started the second round with the same caution. Bassett blasted away, but he couldn't get Giosa back on the floor. As Eddie's head cleared, he began to move, and in doing so, began to paint his comeback masterpiece. Round after round, Giosa moved and punched, piling up points. As his lead became apparent Giosa had to brace himself for another run by Bassett. And like clockwork, Percy stepped it up as the bout wound down. Giosa weathered the storm and finished the fight with the edge (5-4-1, 6-4, 6-4 in rounds). With the win, Giosa raised his record to 54-19-6 and set himself up for a May match against Lew Jenkins (which he won in 10 rounds). Bassett dropped to 28-2. The pair would face off once more the following year at the Met, with Percy taking his own 10-round decision.